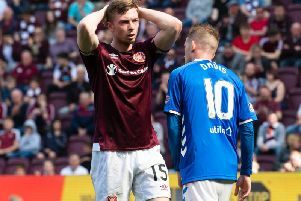 It has not been the greatest of weeks for Hearts. First they failed to capitalise on first-half dominance in the Scottish Cup quarter-final at Partick Thistle on Monday night, having to settle for a replay next week to try and set up a semi-final clash with Inverness Caledonian Thistle. On top of that, the Evening News reported that the club face an anxious wait to find out the severity of the knee injury picked up by Steven Naismith. The club’s top scorer missed the encounter with Thistle after being substituted at half time of the Tynecastle side’s defeat to Celtic last midweek. Across the city at Easter Road, Hibs, under the management of Paul Heckingbottom, have closed to within three points of their city rivals in the league. The Leith side may have exited the cup to Celtic but there is belief that they can jump above Hearts in the table by the season end. Respected statistical analysis website FiveThirtyEight have thrown weight behind that assertion and compounded Hearts’ week by predicting Hibs to finish above Craig Levein’s men on goal difference. Both teams have been forecast to finish on 55 points. Yet, Hibs have predicted to have a plus eleven goal difference, while Hearts’ is down at minus five. After trips to Dundee and Hamilton, Hearts face Aberdeen, Hibs and Rangers before the split. Hibs also face Rangers before games with Motherwell, Kilmarnock and Livingston before their trip to Tynecastle.